Home » New Release » Hitec To Release The X2 700 Charger Boasting 30 Amp Charge Rates! 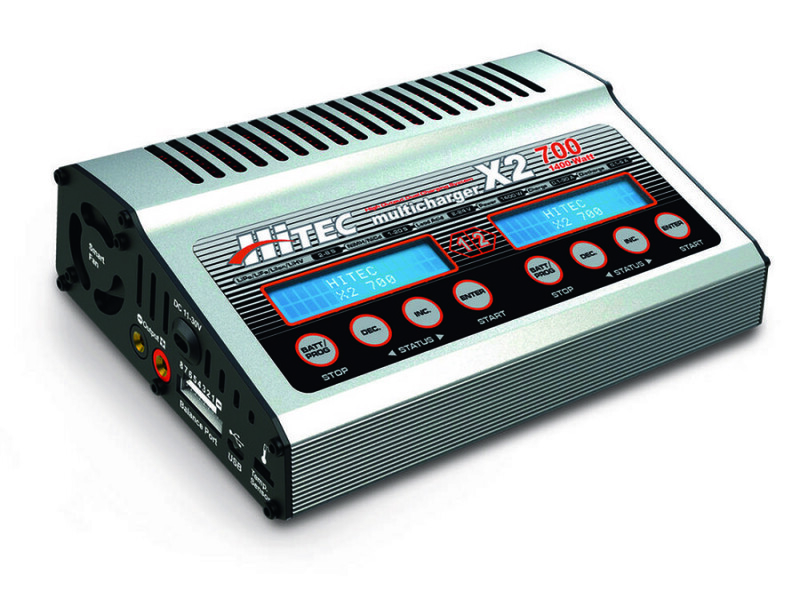 Hitec’s powerful X2-700 Multicharger is the sophisticated charging choice for all your high amperage batteries. This DC powerhouse features two 700-watt output ports for increased capacity and supports all battery chemistries, including the latest LiHV cells. The microprocessor control and an internal resistance meter make this the star at the workshop, flying field and track. Hitec’s free “Charge Master” software allows full PC control of the X2-700 through its integrated USB port from basic setup to full software analysis of your battery’s health and performance. Streamline your operations with the new Synchronous Mode as the second output port automatically mirrors your channel one settings to charge multiple similar batteries with minimal setup time. Reliable and durable, this is a must-have charger for all seasoned hobbyists. DC Mode Output: 700W Port A; 700W Port B. Check on out for yourself right HERE!